Inuktitut, however, is a subject in school, like French or Spanish. The government requires it to be offered till grade three. When I wrote about Euskara (Basque), I noted the same thing. Our exchange student learned everything at her Ikastola in Euskara, from preschool through high school, except for Spanish and English, which were taught as subjects. She told me that she had never done math in Spanish, as a matter of fact. She spoke Spanish at home, so she was completely bilingual in both languages. The number of fluent Euskara-speakers has been on the rise over the past few decades. This system offers a success story like Welsh. If Inuktitut needed an example, I would think Euskara could help in this area. How does the language adapt? The history of Euskara may help, as well. I wrote previously that Euskara has mixed throughout its history with other languages, such as Latin, Arabic, and Hebrew, in addition to Spanish. Nevertheless, it has held strong. Some believe that the language survived because of its isolation, but in my previous post I showed that the language evidences constant contact with others. Rather than remaining isolated, the language adapted to the world surrounding it, century after century. I believe that this is the test for whether a language can survive: not whether it remains isolated, but whether it adapts as the society evolves. The language has to be practical, useable, and efficient for what people—especially young people—want to do. We have to make it fun and interesting for them. I don’t remember anyone making English “fun” or “interesting” for me. I spoke it from my birth (more or less). I spoke it with my grandparents, my parents, my sister, teachers, friends, classmates, football players, and bakers. I used it for every conceivable context. Very useful. I don’t “enjoy” speaking English today, but I speak it every day. For a child at school for 5-6 hours per day, whatever language you use with them at school will be incredibly practical. If it’s the only way they can communicate with their teachers and classmates, they won’t even know they’re speaking it; it will simply come out of their mouths. If, however, the language is an object of study, it will be like music or art or math: a nice passtime, but children will eventually choose whether they “like” it or “excel” at it. They will ask the question about whether it is useful or not. Inuktitut has to move out from its frozen isolation and confront anglophone Canada. 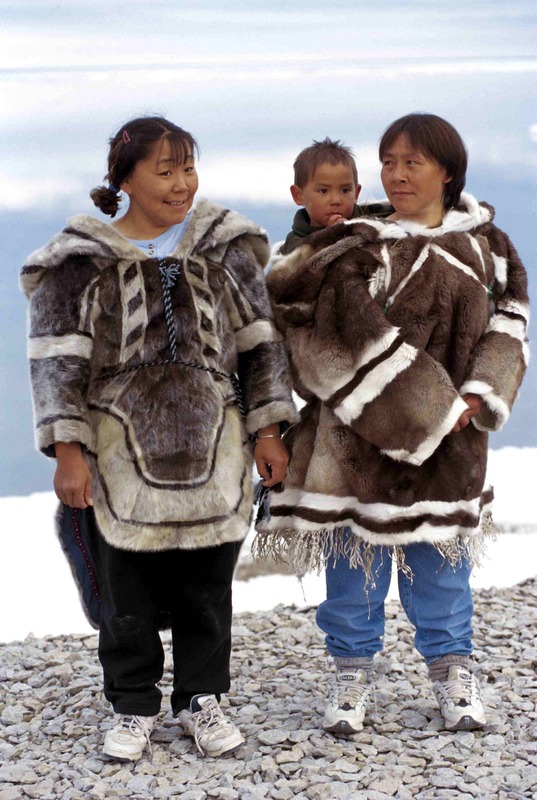 The Inuit must create an environment where Inuktitut is the most practical language for children to speak. If speakers of Euskara can talk about math, engineering, clothes shopping, and pop music, the language can live. If it lives isolated to discussions about traditional fishing and dancing, the language is doomed. Inuktitut has to become the everyday currency of Inuit children. The ideal is for Inuit children not to think of Inuktitut as fun or interesting. The goal is for them not to think about Inuktitut at all, but to think in it throughout the day, whatever they’re doing. How can minority languages appeal to kids to use all the time? Agree totally, Richard. To create the environment where the language is almost “invisible” seems to me you have to imagine a complete society and life through the language too. Iceland shows that numbers aren’t key to having a language used naturally in all domains of modern life. The Basques are quite a bit ahead of the Welsh here, though there’s a lot of good stuff going on in Wales and I’m sure the meeting with the Inuit will have been appreciated by both sides. The report you link to on Welsh is, sadly, not correct (see https://en.wikipedia.org/wiki/Welsh_medium_education). About a quarter of Welsh schools teach through the medium of Welsh. The number has hardly increased for 15 years. Only about 5% of university students study through Welsh, and this in a country with a MUCH stronger written literary tradition than in Euskal Herria and which, at the beginning of the industrial revolution had the highest popular literacy rate in the world (and in Welsh). Welsh as a subject is compulsory in the English-medium state schools, but few pupils get fluent that way (reforms are being discussed at the moment). A big difference is that in the Basque Autonomous Region, the goverment has been in the hands of the PNV (except for a brief interval) since the earlly 80s and they are enthusiastic advocates of Basque identiy and nationhood and Basque has a much more extensive, and more independently minded media, than Wales. Wales is run by the British Labour party, which is half-hearted at best about the language. Sometimes it has talked the talk but it is not walking the walk. You got here before me… I was about to make the same correction. The Welsh Knot (2010), https://www.youtube.com/watch?v=U0bgSbJUBG0, explores the difference between Welsh-immersion in South Wales and Welsh-medium in North Wales, and whether education is really enough. An Feidir Linn (2009, maybe), https://www.youtube.com/watch?v=bPYdADwLYbQ, discusses with typically Irish pessimism exactly what’s going wrong with keeping the Irish language alive, and compares it to Welsh and Basque. An excerpt from No Bearla 2 (2008), https://www.youtube.com/watch?v=uA7hlurc9EQ, where a Manx revivalist emphatically tells Manchan than compulsory language in schools is the wrong way to go about it. I’ll take a look at those videos. What hit me the hardest was your assertion that languages have to evolve. The young folk have to discuss technology and social media. If their local languages do not adequately cater to this need, they will naturally discard them, no matter how slowly.